The biggest issues that I have been overcoming in these last awesome 16 weeks is the law of growth, the positive images about myself and believing I am in complete control of everything in my life. I have said this before. My week for MKMMA starts on Monday. It so happens that Friday night I seem to find the lesson or Ah-Ha moment. I then spend the next day incorporating it in my mind and solidifying it my feelings. This is a great lesson that came to me in my inbox Friday. Is was really the perfect time and something I needed at this time! Roughly 10 years ago, a business friend, Art McCauley, created a marketing program that teams a life insurance product with U.S. savings bonds. It allowed an insured who purchased a voluntary insurance product to purchase bonds, as well, through payroll deduction. McCauley first conceived of the idea nearly 15 years ago, but it took him several years before he was ready to engage such a program and its corresponding support services. When he first unveiled the offering, he was able to make some sales but knew there was the potential to accomplish more. Along the way, he refined the offering by adding enhanced client services. He also brought in a critical illness insurance product to provide an additional sales opportunity. Gradually, McCauley built up broker relationships, proved the value of his program to customers and developed a roster of positive references. He worked hard to succeed even though he sometimes wondered whether it was worth it. It’s amazing how any given sales success might seem like it took place overnight, even though it might have taken years to achieve. 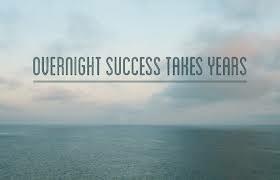 As the example illustrates, overnight success might not actually happen overnight. –Belief with passion. As years went by with only marginal success, McCauley never gave up on his idea. He passionately promoted it to his business contacts. –Consistency, consistency, consistency. Often, McCauley was tempted to give up. But he persevered and delivered his message to both prospective customers and business associates year after year. –Business partners with integrity. When there is a great idea on the table, the creator has to seek out business partners (carriers, service providers, co-marketers) who will share in the vision without stealing the idea. We have been learning this and seeing it more and more in our world within. MKS still lives and I am living it more with excitement every day! A great example of persistence and staying the course. This is a great blog. Week 16 message hit home. Your openness to your own personal journey you’re going through, is always an inspiration to me. Keep up the GREAT work my Friend!! Great post, Brian. I have a friend in Oklahoma who is an accomplished guitarist and is very in-demand. Took her 12 years to become an overnight success. Wonderful. There was a lesson in patience tucked in there as well, thank you.